The 3rd annual South East Texas Tomato Festival (SETTFest) returned to the historic Washington on the Brazos state park on June 13th, 2009. We had our best turnout yet, with familiar faces, new folks, and unexpected guests. We had a great time, had everything set up early, so we could just enjoy visiting with folks. Our mission at SETTFest is to introduce heirloom tomatoes to Central and South Texas gardeners and farmers alike, dispel the myths that only ‘heat setter’ varieties can be grown here, and offer advice and seeds wherever we can. So it was great to see folks asking lots of questions (including a few stumpers! ), gathering seeds, and talking shop. We are thrilled that more and more folks are bringing tomatoes and other items as well. There was a nice spread of breads, cheeses, pasta salads, etc. This was a tough year for tomatoes in our area due to the heatwave and torrential downpours in early May. But still most folks managed to get something and we enjoyed tasting varieties that others brought. Indeed one of the best varieties at the event was Atkinson. Thanks all for making this a great event! View photos of the 2009 SETTFest! This was a fabulous event. I have never seen so many different types of tomatoes side by side! The people were wonderful, the tomatoes tasty, and the information and expertise were extraordinary! I wish I would have found your site sooner. Can’t wait to attend in 2010. 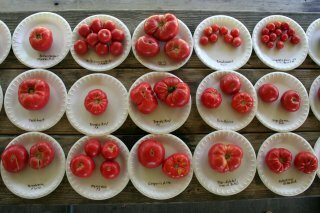 I didnt know there were so many tomato addicts in Central Texas.